Earlier known as Lilium giganteum. This is probably the most magnificent plant from the Himalayan Region. 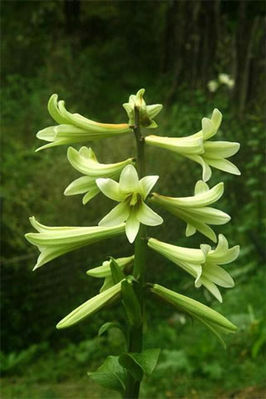 The flower stems of this majestic plant is cut and united using it as a pipe to carry water in the villages. They have gigantic heart shaped leaves with a metallic sheen and grow upto 50 cm long. The tall. thick spikes produce numerous pure white flowers with purplish-maroon throat each measuring 15-18 cm long . A highly recommended, cold hardy garden plant. Excellent woodland planting material for cold areas.